Black Friday. The very word conjures up images of trampled consumers fighting their way into retail stores at four o’clock in the morning. For some, it’s a day to score unbeatable bargains. For others, it turns out to be nothing short of a nightmare. The annual shopping extravaganza is a bit ironic. Less than 24 hours after Americans sit around the dinner table proclaiming what they’re thankful for, they rush out to buy more. It’s not an official holiday, but may as well be. 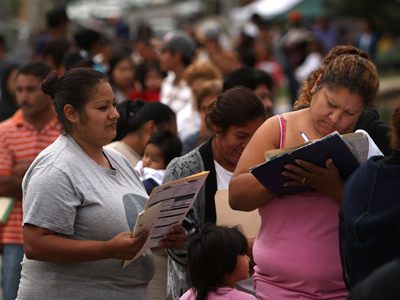 Coupon clippers and bargain hunters wait the entire year to land expensive electronics. They line up in the dark – many armed with chairs, sleeping bags, and thermoses of coffee – hoping to score giveaways, cash and a truckload of consumer goodies. And while Black Friday isn’t a new concept for America, it does appear to be an ever-evolving one. Historically, it was common for shops to open their doors at 6 am on the day after Thanksgiving – but in recent years, that time has slowly crept upwards, with many shops opening at 3 am. 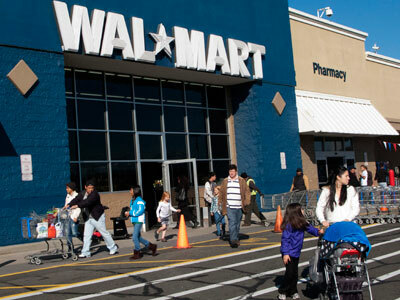 This year saw the most drastic changes, with a number of stores opening on Thanksgiving night. One of those stores was Walmart. 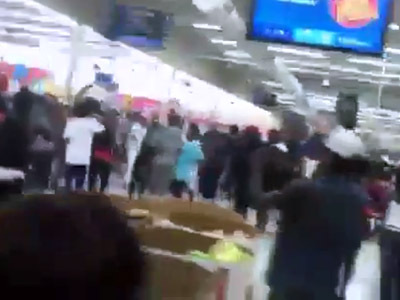 And at 12:30pm, the Walmart in Tallahassee, Florida received an extra dose of mayhem, as if armies of shoppers pounding through the doors with carts weren’t enough. Two people were shot outside the store’s entrance – and the expected cause was a scuffle over a parking space. The two victims were treated for non life-threatening injuries, and the suspects are still on the loose. 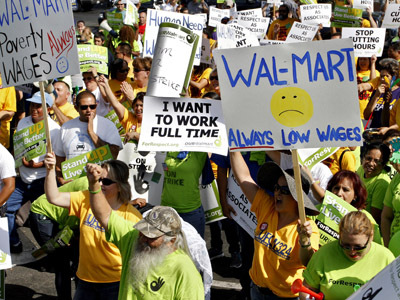 Another Walmart-related drama took place on Black Friday, too – but this time between the mega retailer’s own employees. When the store opened its doors at 8 pm on Thanksgiving, employees across the country walked off their jobs and picketed, in a response to low pay and poor working conditions. The humorous and often terrifying stories happen every year – but never cease to amaze. A Sears in San Antonio became a battleground on Friday, after a line-cutting man was met with a fellow customer’s gun. Dozens of shoppers were unhappy with the man, who tried his best to shorten his wait time – at the expense of patient customers. The aggression started verbally, with fellow shoppers calling the man names. It took a turn for the worst when the man responded by punching another man in the face. And the events became increasingly more ridiculous as the day progressed. The punched man pulled out a gun, forcing the line-cutting man to hide behind a refrigerator before running out of the store, witnesses told San Antonio Express-News. After the scare, shopping resumed with almost no interruption. It seems that at least some Americans are recognizing the merit in enjoying the true meaning of Thanksgiving. Buy Nothing Day could be described as the anti-Black Friday – a protest against consumerism. And it should come as no surprise that it takes place on the same day. “Make a vow to yourself to participate in Buy Nothing Day this year. This November 23rd, go cold turkey on consumption for 24 hours… see what happens… you just might have an unexpected, emancipatory epiphany,” a statement on the Adbusters website read. 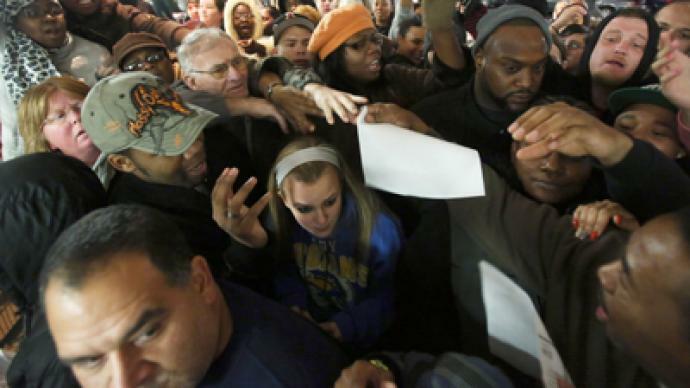 But there may still be hope for those who remain unconvinced that Black Friday isn’t worth the stress. Online Black Friday deals have managed to pull some customers away from the registers, as more and more consumers choose to shop from the couch. And for those who missed the big Friday events, there’s always Cyber Monday: the Internet’s very own shopping bonanza, which takes place just two days after Black Friday.